TOKYO/SEATTLE (Reuters) - Japan Airlines Co Ltd said it temporarily grounded one of its Boeing 787 Dreamliners at Tokyo's Narita International Airport on Tuesday after white smoke was spotted outside the plane and a battery cell appeared to be leaking. The incident raised fresh concerns about the 787's safety and reliability almost exactly one year after the global Dreamliner fleet was grounded by regulators following the overheating of two batteries, although Boeing said design changes made as a result had worked as planned. Boeing Co said it was "aware of the 787 issue that occurred Tuesday afternoon at Narita, which appears to have involved the venting of a single battery cell." Venting is the process of fumes and heat being channeled outside the aircraft when the battery overheats. "The issue occurred during scheduled maintenance activities with no passengers on board," said Boeing. "The improvements made to the 787 battery system last year appear to have worked as designed." Boeing shares fell 0.6 percent to $139.87 on the New York Stock Exchange. The incident, which was disclosed by Japan Airlines early on Wednesday local time, came nearly a year to the day after Japan Airlines and All Nippon Airways grounded their 787 fleets after two 787 batteries overheated on two different planes in less than two weeks. Global regulators grounded the worldwide fleet on January 16, 2013. The 787s remained grounded for more than three months while Boeing redesigned the battery, charger and containment system to ensure battery fires would not put the airplane at risk. The cause of the battery problems has not been determined. United Airlines, the only U.S. carrier that uses the 787, said: "Our 787s are operating normally and we have not experienced any issues with our batteries." Japan Airlines said maintenance engineers who were in the cockpit saw white smoke outside the plane. When they went outside the aircraft the smoke had dispersed. On returning to the cockpit, the engineers found warning lights indicating possible faults with the main battery and charger. When they checked the battery they found one of eight cells was leaking a liquid. 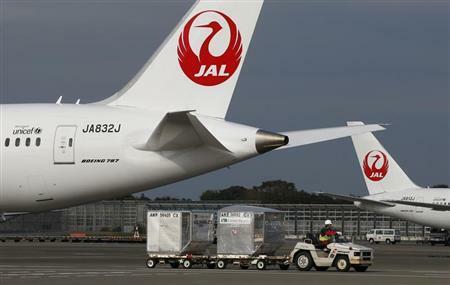 The plane, due to depart from Narita for Bangkok, was taken out of service, and the 158 passengers due to board the plane were put on a separate 787, JAL said. The 787 Dreamliner is Boeing's state-of-the-art plane, built with carbon-fiber composite materials and a powerful electrical system to reduce weight and improve the jet's fuel efficiency. But the 250-seat jetliner, which costs about $212 million at list prices, has been plagued with problems. It was more than three years late in entering service, due to issues with parts fabrication by suppliers around the world. Since entering service, it has had issues with brakes, fuel lines, electrical panels and hydraulics, and other systems. The overheating of the jet's lithium-ion batteries raised serious concerns last year, prompting world-wide grounding of the fleet after a fire on a Japan Airlines plane in Boston and a second battery that overheated on an All Nippon Airways flight in Japan less than two weeks later. In July, after the 787 was cleared to return to service, an Ethiopian Airlines jet caught fire at London's Heathrow Airport, scorching the fuselage. The cause of the fire was never firmly established, but UK investigators traced the probable cause to faulty wiring of a lithium battery in an emergency beacon located in the ceiling near the tail of the plane. Aerospace experts said the latest Japan Airlines incident was troubling, but were cautious about drawing broader conclusions. Richard Aboulafia, an aerospace analyst at Teal Group in Fairfax, Virginia, said the incident raised two questions: whether the new system that contains the problem had worked, and whether the root cause of the battery problems will ultimately be discovered. "The real issue with containing the problem, rather than getting to the root cause of the problem, concerns economics," Aboulafia said. "Incidents can be successfully contained, but if you continue to see incidents like these, you've got a mounting bill from taking jets offline, and repairing their battery systems. You've got an image problem, too." Hans Weber, a former FAA adviser and president of TECOP International, an aerospace technology consulting firm, said the incident might provide more clues about the cause of the problem, such as overcharging. He said it appeared the containment system worked. "It limited the problem to one faulty cell. It contained the problem and vented the fumes outside the airplane, as designed," he said, basing his comments on Japan Airlines' initial statements about the incident. The U.S. National Transportation Safety Board said it is aware of the incident and is gathering information. Separately, the NTSB is still investigating the battery fire that occurred on the Japan Airlines 787 in Boston a year ago, and said last week it is due to complete that investigation in March. The agency did not say whether the latest battery incident would affect the timing of the Boston investigation. The U.S. Federal Aviation Administration said it was working with Boeing and the Civil Aviation Bureau of Japan to investigate the battery malfunction. The agency certified Boeing's revamped 787 battery system as safe last year after the Dreamliner fleet was grounded for more than three months. The agency also launched a review of the design, manufacture and assembly of the 787 in January last year and said its report would be released last summer, but it has so far not released the report and has not responded to questions about when that review would be finished.